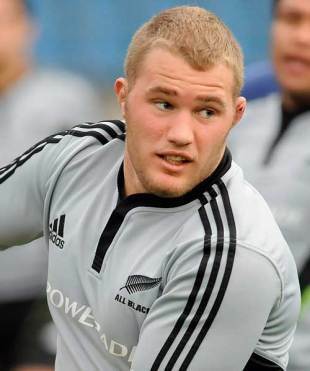 All Blacks prop Owen Franks is one of five players to commit themselves to the New Zealand Rugby Union ahead of the forthcoming World Cup. Franks is joined by Richard Kahui, Isaia Toeava, Zac Guildford and Andy Ellis, who have all re-signed with the union. Franks, a 23-Test veteran extended his contract with the NZRU and the Crusaders through to the end of 2014. Meanwhile his Crusaders and All Blacks teammates, half-back Ellis and winger Guildford, have also re-signed with the NZRU and the Crusaders for two years through to 2013. All Blacks midfielder Kahui has also re-signed for a further two years with New Zealand and the Chiefs franchise, while Blues and All Blacks paceman Toeava has extended his New Zealand and Blues contract through to the end of 2012. The five join an impressive, growing group of current and recent All Blacks who have re-committed to New Zealand rugby after this year's Rugby World Cup. Those staying include captain Richie McCaw, Daniel Carter, Keven Mealamu, Andrew Hore, Corey Flynn, Tony Woodcock and Ali Williams. Franks - who has made 41 appearances for the Crusaders - said New Zealand was where he wanted to be. "It's been an exceptional and challenging year for the Crusaders but it is important to me that I continue my rugby with the franchise and for the All Blacks." Toeava, who played his 31st Test against South Africa yesterday, said playing for the Blues and the All Blacks was "pretty special". "We had a good season this year with the Blues but injury kept me out for a lot of it so I feel like I've got some unfinished business to take care of there and I'm still keen to play for the All Blacks." NZRU chief executive Steve Tew welcomed the latest re-signings as "fantastic" news for New Zealand rugby and for the All Blacks beyond this year. "We always knew that it was critical to retain as many All Blacks as possible post-Rugby World Cup 2011 to ensure continuity for both the franchises and the national team," he said. Crusaders Coach Todd Blackadder said he was "stoked" that Franks, Ellis and Guildford had committed to continue their rugby with the Crusaders. "Tenacity and leadership have been crucial traits for the Crusaders in what has been a challenging year for everyone in Canterbury," Blackadder said. "Retaining these guys gives us a great boost as we look toward our 2012 campaign both on and off the field." Blues Coach Pat Lam said Toeava was a "dynamic" player who just kept on getting better. "He is a strong voice in our backline and his impact is massive. It's no secret Ice (Toeava) was sought after offshore and I'm thrilled he wants to stay with the Blues." Kahui thrived on regular game time with the Chiefs in this year's Super Rugby after a bad run of injuries. He earned his 12th cap with the All Blacks overnight. Chiefs chief executive Gary Dawson said the team was "thrilled" about Kahui's re-signing. "He's a world class player who has demonstrated tremendous commitment and loyalty to New Zealand rugby and the Chiefs," Dawson said.